Available November 11 on DVD and digital download, the release features 10 hilarious “peppasodes”, based on the popular Nick Jr. series that follows the adventures of Peppa, a loveable, exuberant little piggy who lives with her brother George, Mummy and Daddy. Two of my nieces are enamored with Peppa Pig. The animated television series, geared towards preschoolers, follows the adventures of Peppa Pig and her animal friends. In addition to pig characters, some other animals featured are dogs, cats, sheep and rabbits. They all display humanlike characteristics. 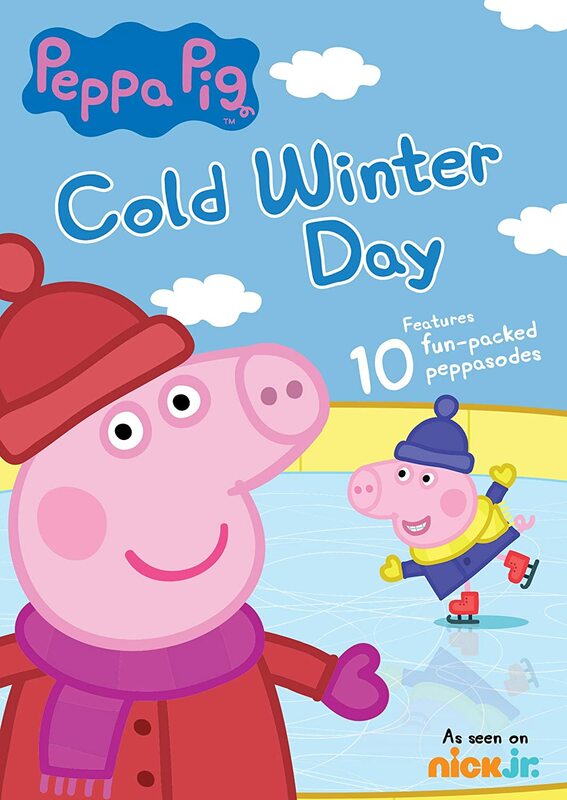 The newest DVD Peppa Pig: Cold Winter Day has ten separate episodes, with a total running time of 60 minutes. Most of the episodes are centered around things done in the colder time of year and with snow. It's an adorable DVD to watch all year round, especially in the upcoming months. One person will win Peppa Pig: Cold Winter Day on DVD. I love the snow maybe twice a year! I love snow around christmas time, but after that I'm ready for spring! I'm from Georgia, so I like snow, but only for a few days a year. I love love love snow! It's just beautiful. I love snow but only during the holiday season. Blizzards are by far the worst lol. I love snow - just not ice storms! I do NOT like snow. I have had enough. I am now where it does not snow. I enjoy the snow :) I think it's so beautiful! No...I don't like snow. We had so much the last couple of years and I worry about everyone driving in it. I like watching it from my window when the snowflakes are big! Other than that I can't stand it! OK, forget it. I hate snow. I love snow! unless I have somewhere to be. LOL! I love the snow as long as I don't have to drive in it! We don't get snow where I live which makes the holidays pretty disappointing. The few times I've seen/experienced it though, it was beautiful and fun to play in! not a fan at all of snow. I like snow on the grass but not on the roads!!! I like snow but it does not snow where I live. we love snow and are hoping to get more this Winter Season! My son is a huge Peppa Pig fan. He would love this DVD and winter will be here soon in Minnesota. I love snow! I think it is beautiful! However, I have only had the opportunity to experience it 3 or 4 times and it wasnt much. Living in the deep south does not grant many opportunities to experience snow. I live in Florida so no snow here but I would love to see some! In small doses snow is okay, but I'm from Georgia, so snow is not an every-winter thing for me! Oh winter is my favorite season! We LOVE the snow!!! So beautiful! We live up north so we get alot of it all winter long! I don't mind the snow but have never really lives in it. I like to have a good snow maybe once each winter, but after that I have had enough for a while. I like it if it's not overwhelming. I do as long as I don't have to shovel it. I love snow, especially when I go skiing in the winter. It's pretty, but we tend to get blizzards so it is not fun for long. I love the snow when I visit it. I don't love it if I have to live and drive in it all the time. If I never saw snow again I'd be happy. No, I am not a fan of snow...at all. I like the snow, especially a big snowstorm, then I want the snow to go away. I like the way it looks the morning after a snow when the trees are white and the sun is shining. I like snow in the month of December, but after that I only like it if we get a big snowstorm. I do not like the snow. It is very messy and hard to travel in. I love snow!! I like to get at least one good snow every year. I absolutely hate snow, hate winter, and hate being cold..LOL enough said!! Yes, I like snow. Especially for the holidays. Only on Christmas Eve. I don't like being cold and shoveling snow. I like snow as long as I don't have to shovel out of it. I love snow & really enjoy it when it snows, but I hate ice storms! I love the snow!!! Just don't like the cold that comes with it! Snow is always a fun experience. I live in South Florida and I have only seen snow twice when I was on vacation. Snow is fun to an extent, but not that fun when you have to drive to work in it every day. I heart a dusting of snow on Christmas Eve. My son loves snow but his dad and I are not big fans. I like the snow as long as I don't have to drive in it. Thanks!! I like snow as long as it melts quickly. I am not really a cold weather person. I do not like the snow and I do not like winter at all. The cold hurts my bones. I absolutely love snow. It is so beautiful falling. I love snow if I'm indoors. In Texas we don't see much snow. I don't think I would do well in a blizzard. I like snow, I just don't like the cold that follows.